Your new triple threat kitchen set makes prepping, storing, and serving a breeze. Paired with handy tool tops, nostalgic Mason jars become clever prep, storage, and serving companions. The classic canning jar comes with a dipping pot to keep salad and dressing or yogurt and granola separate but in the same sealed package, while the spiralizer makes it easy to create fancy vegetable curly Q's that store as they unfurl. 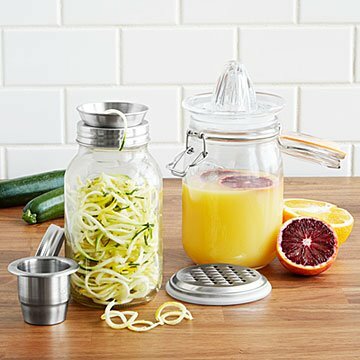 The cliptop jar pairs with a grater top for mess-free cheese or veg prep, and a juicer top to squeeze and store fresh citrus juice. Made from durable stainless steel and soda glass with silicone seals. Made in China. If you think the parts will fit the other jars you already own you would be wrong. The parts only fit Kilner jars. Do not buy unless this is the brand of jars you own. Worthless for folks with lots of Ball mason jars. My friend uses this at work to add a little excitement to her lunch. It beats taking a sandwich everyday. I just eant to save you rhe mistake of buying for someone who cooks. They likely have these tools that perform at a much higher level. Piralizer too small to spiral. Juicer is messy and again they likely have a better handheld device. The grater is too small and much more unwieldly than a box grater. But i guess it looks cute. Save yourbmoney and look elsewhere for a gift! I would buy this again and as gifts!!! No fuss, very simple to use and clean! Could not be happier with the multi use functionality. Only one spiralizer size. Great for mason jar meals on the go, or spiralizing dinner noodles for the whole family!!! This was easy to use and I liked the attachments that come with it.